Slightly narrower and taller than your typical dresser, this contemporary chesser is the perfect piece to complete a smaller bedroom. With its eight drawers, you still get plenty of storage without taking up quite as much floor space. This particular chesser has the added benefit of being the perfect place for a TV as well, thanks to a drop-front drawer that reveals an HDMI port, RCA plugins, and outlets. Whether you put a tv on it to utilize its ample countertop space or mount it on the wall behind it is up to you, but either way cables will be out of site thanks to a hole at the back of the drop-front drawer. 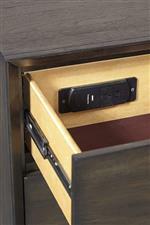 The piece also features two felt-lined drawers in the top row for keeping jewelry or other sensitive items safe and out of sight. 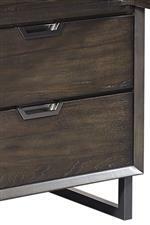 Sharp horizontal and vertical lines add to the modern look of the piece, as do its gunmetal finished base and hardware. 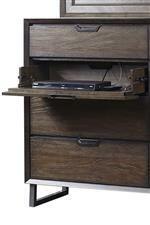 Put it all together and you get the perfect piece for today's bedroom. 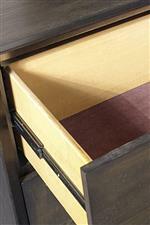 The Harper Point Contemporary 8 Drawer Chesser with Felt-Lined Top Drawers by Aspenhome at Walker's Furniture in the Spokane, Kennewick, Tri-Cities, Wenatchee, Coeur D’Alene, Yakima, Walla Walla, Umatilla, Moses Lake area. Product availability may vary. Contact us for the most current availability on this product.